The flooring in your home is one of the most important design elements in your entire property. It can be a bit difficult to ensure that any new flooring you choose perfectly fits your needs in style, performance, lifestyle and budget. The value and comfort that hardwood floors bring to your home’s décor make them a popular choice for homeowners. Our team is proud to offer you an impressive selection of engineered hardwood, hand scraped hardwood, reclaimed hardwood, and solid hardwood flooring that is perfect for your home or business, no matter the style. Blending the time-honored tradition of crafting wood by hand with the benefits of today’s modern engineering and pre-finishing make hand scraped hardwood a preferred choice for many homeowners. Every plank of this hardwood is sculpted specifically to create a warm, antiquated look that is both trendy and exciting. At the same time, this style is also able to provide the durability necessary to combat the wear and tear caused by children, pets, and furniture. The cost of hardwood flooring is a deterrent for homeowners looking to upgrade their home’s floors. There is a solution to this budget issue, thanks to engineered hardwood. Made from real wood, this type of flooring gives you the look you want while also being a more affordable choice as compared to regular solid hardwood flooring. In addition, engineered hardwood is less susceptible to expanding and shrinking during weather changes and even provides an extra layer of protection to ensure longevity. This is a great flooring option for people even with the tightest budgets. Nothing beats solid hardwood flooring when it comes to giving you that classic, customizable look you want for your home. Milled from solid wood and provided to you unfinished, this type of flooring allows you to pick out the perfect stain and style that best matches the mood and style you want to create for your home or business. 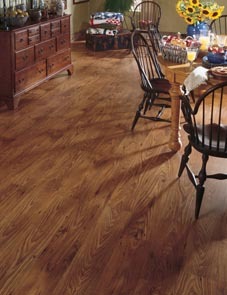 When you want a stunning, personalized look while maintaining complete creative control, choose solid hardwood flooring. Contact us when you are looking for high-quality hardwood flooring that is perfect for your home or business. The talented team of flooring technicians at our company is ready to serve customers living throughout the communities of Otsego, Minneapolis, Maple Grove, Brooklyn, Buffalo, Elk River, Anoka, Rogers, Wayzata, Zimmerman, Princeton, and Plymouth, Minnesota.